Today we’re officially launching our new major project – AskThem.io– a free & open-source platform for questions-and answers with elected officials at every level of government. We’re thrilled to promote another powerful dimension of AskThem- enabling users to target questions and petitions to any verified Twitter account. Our aim is to promote dynamic dialogue between influential figures and entities across disciplines- from prominent journalists and artists to businesses and government agencies. Sign up here before we launch to register for an account and be one of the first to submit questions to a public figure or elected official. Under “Who should answer this question” select the the “their twitter name” button. 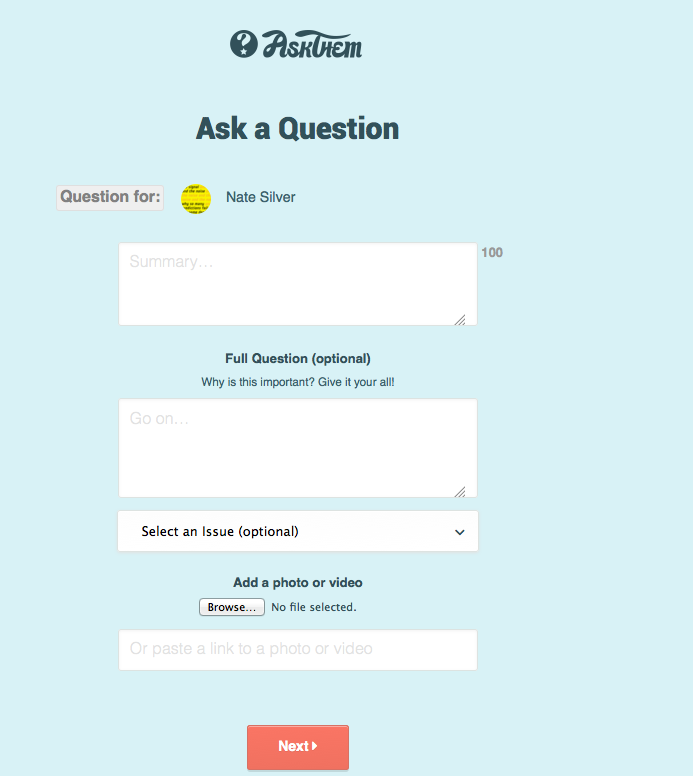 Type in your your desired twitter handle to submit a question. Promote your content over social media and encourage other users to sign on and support your question to push for a public response.